Amphetamine is a Schedule II controlled substance available by prescription (Dexedrine) and is also available on the illicit market. Amphetamines are a class of potent sympathomimetic agents with therapeutic applications. They are chemically related to the human body’s natural catecholamines: epinephrine and norepinephrine. Acute higher does lead to enhanced stimulation of the central nervous system and induce euphoria, alertness, reduced appetite, and a sense of increased energy and power. Cardiovascular responses to Amphetamines include increased blood pressure and cardiac arrhythmias. More acute responses produce anxiety, paranoia, hallucinations, and psychotic behavior. The effects of Amphetamines generally last 2-4 hours following use, and the drug has a halflife of 4-24 hours in the body. About 30% of Amphetamines are excreted in the urine in unchanged form, with the remainder as hydroxylated and deaminated derivatives. Opioid analgesics comprise a large group of substances which control pain by depressing the central nervous system. Large dose of morphine can produce higher tolerance levels, physiological dependency in users, and may lead to substance abuse. Morphine is excreted unmetabolized, and is also the major metabolic product of codeine and heroin. Morphine is detectable in the urine for several days after an opiate dose.4The OPI One Step Opiate Test Strip is a rapid urine screening test that can be performed without the use of an instrument. The test utilizes a monoclonal antibody to selectively detect elevated levels of morphine in urine. The OPI One Step Opiate Test Strip yields a positive result when the morphine in urine exceeds 300 ng/mL. 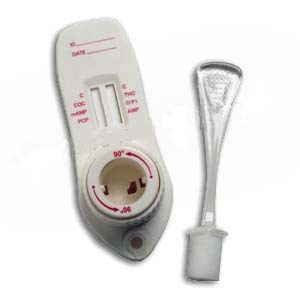 The OPI One Step Opiate Test Strip is a rapid urine screening test that can be performed without the use of an instrument. The test utilizes a monoclonal antibody to selectively detect elevated levels of morphine in urine. The OPI One Step Opiate Test Strip yields a positive result when the morphine in urine exceeds 2,000 ng/mL This is the suggested screening cut-off for positive specimens set by the Substance Abuse and Mental Health Services Administration (SAMHSA, USA). • The test panel should remain in the sealed pouch until use. • All specimens should be considered potentially hazardous and handled in the same manner as an infectious agent. A drug-free urine pool was spiked with drugs to the concentrations at 50% cut-off and 25% cut-off. The results are summarized below. A study was conducted to determine the cross-reactivity of the test with compounds in either drug-free urine or Cocaine, Amphetamine, Methamphetamine, Marijuana, Opiate or Phencyclidine positive urine. The following compounds show no cross-reactivity when tested with the One Step Multi-Drug Screen Test Panel at a concentration of 100 ng/mL.